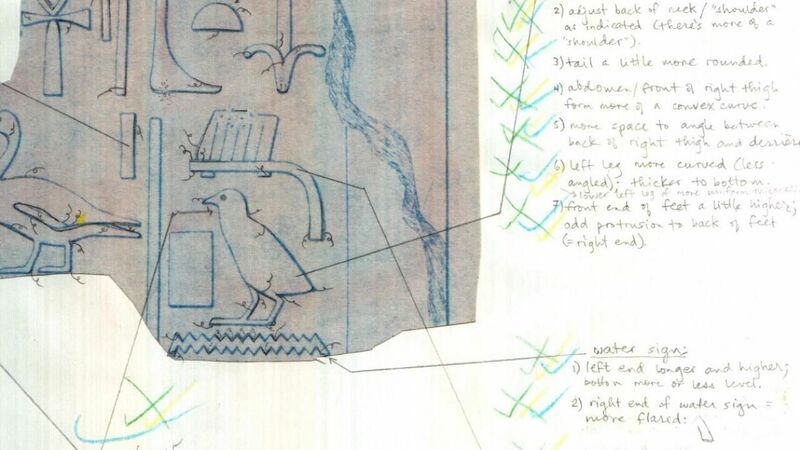 Blueprints of the original artwork have always been essential to the Epigraphic Survey’s collation methodology. They are an exact reproduction of the original drawing, created by using a contact print process on light-sensitive sheets. 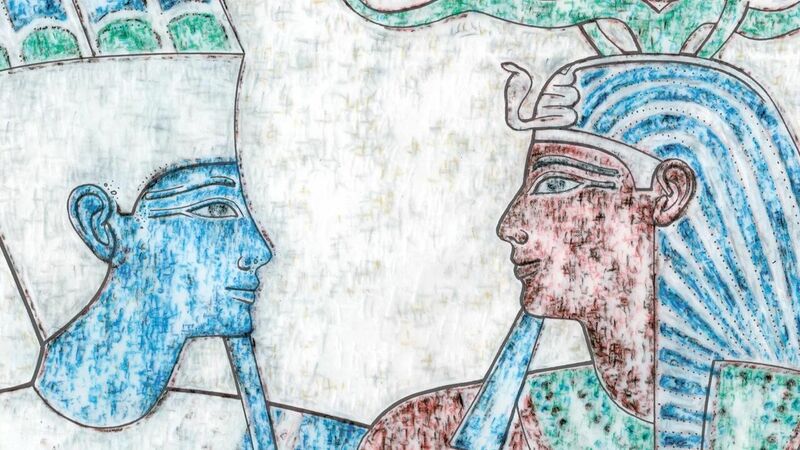 The color blue helps the epigraphers by making it possible to record corrections clearly in pencil on the printed sheets. There are usually blueprints of each drawing made, one of which is cut up into several manageably sized sheets and is used for indicating individual corrections and recording additional details, while the other one is used for overall reference and for adding modifications that affect the entire drawing. 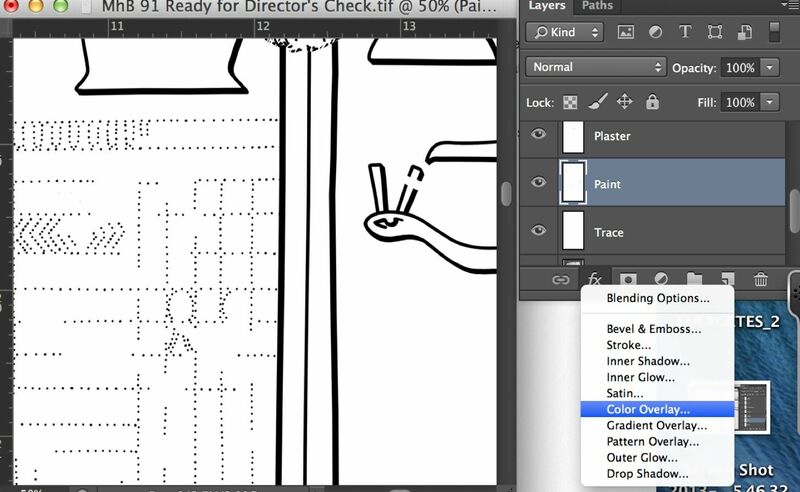 Drawing in Photoshop, however, means that the artist has to produce the blueprinted copy digitally. For now, this Manual will show the user how to produce the blueprints exactly as one would have when drawing on paper. But one must keep in mind that, with the technical background constantly evolving, this particular area will go through some necessary changes as well. 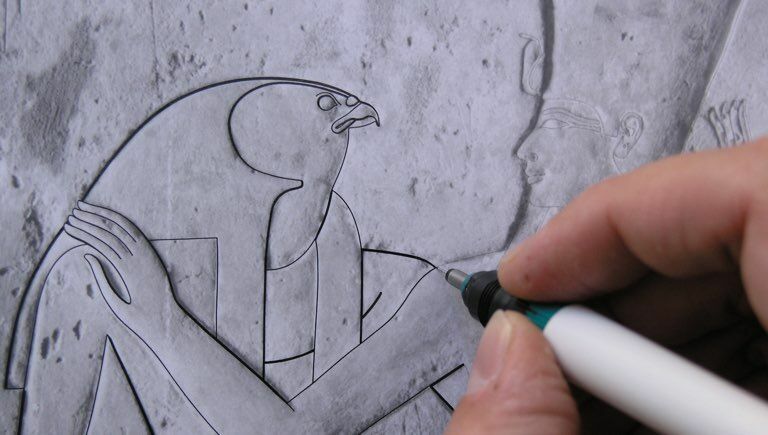 The artist needs to execute a few modifications to be able to work with a color version of his/her drawing. 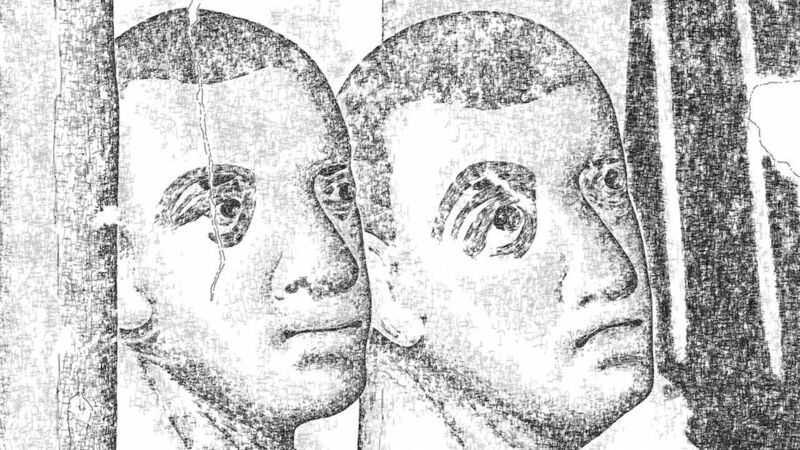 The drawing is created in a grayscale environment, so any color that would be applied on it would show as a shade of gray. To be able to add colors to our drawing, we have to change its Image Mode to RGB. When the artist chooses a different color mode for an image, he/she permanently changes the color values in the image. 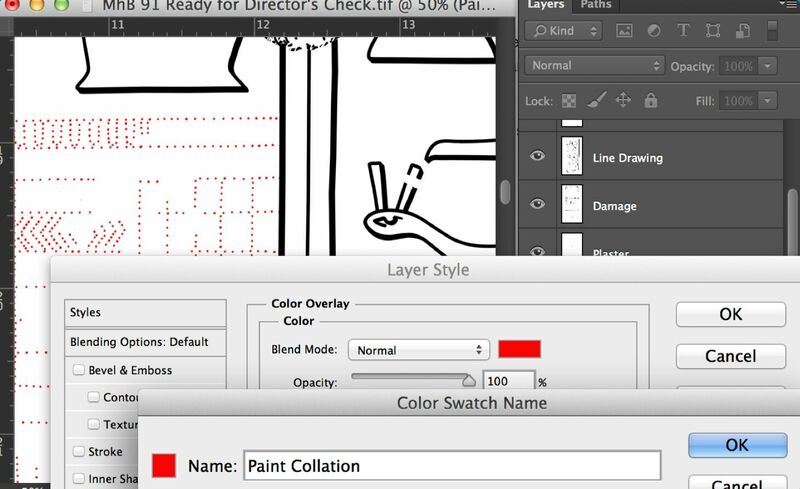 It is recommended to merge the layers (collapse all layers into the top one) before applying any color modifications, because the interaction of colors between layer blending modes changes when the mode changes. For a certain sequence of actions to be applied repeatedly, it’s advisable to save a template (Style) to add some automation to the process. 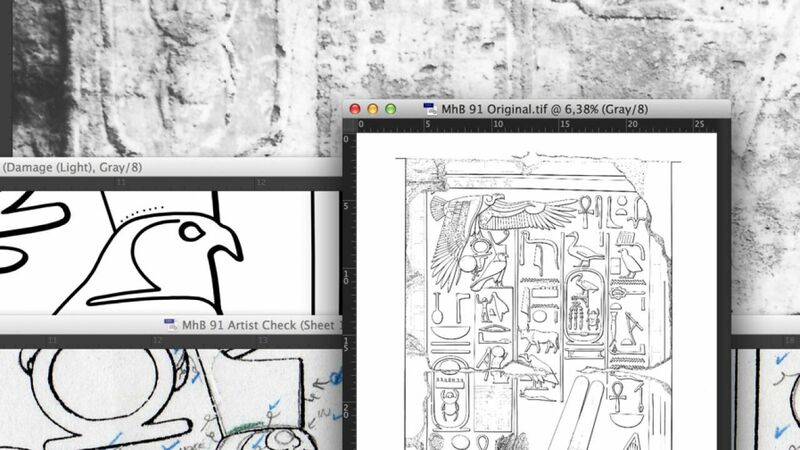 (1)Any enhancement of the entire document should happen on a merged version of the drawing, with no background or reference layers included. (2)Make all the layers that shouldn’t be part of your blueprint invisible, then go to Layer and choose Merge Layers. When asked if you want to “discard hidden layers” click OK.
(3)Change the color mode of your drawing to RGB (Image/Mode/RGB Color). Note that using RGB mode adds quite a bit to your file size. The image quality shouldn’t be changed (8 Bits/Channel). 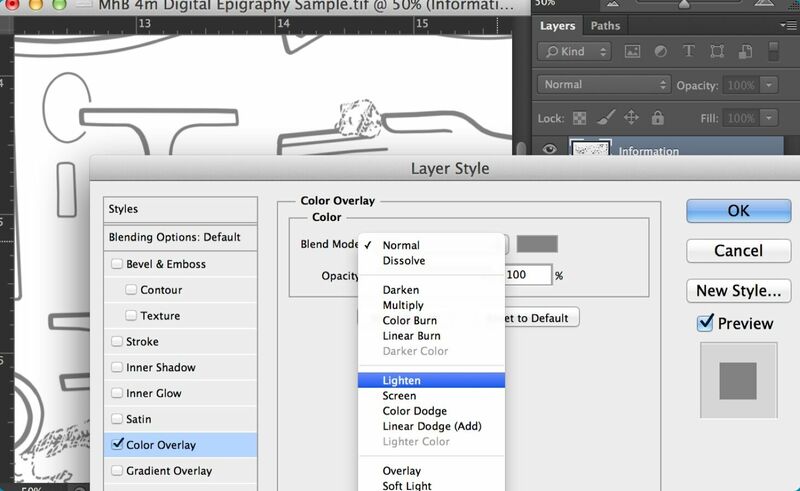 (4)Add a Layer Style to your drawing. Pick Color Overlay from the drop-down menu. 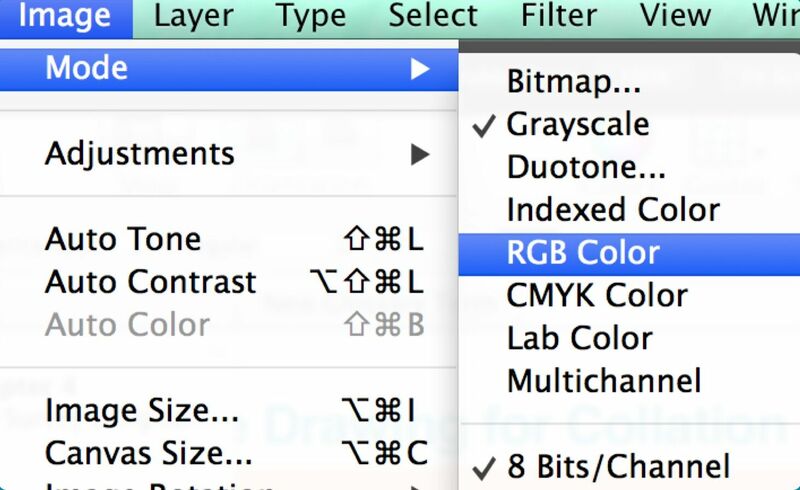 This command opens the Blending Options panel at the Color Overlay side menu. (5)Change the blend mode of the drawing from Normal to Lighten. Lighten excludes all the white pixels (white brush strokes over damage) from the color changes applied in the next step. 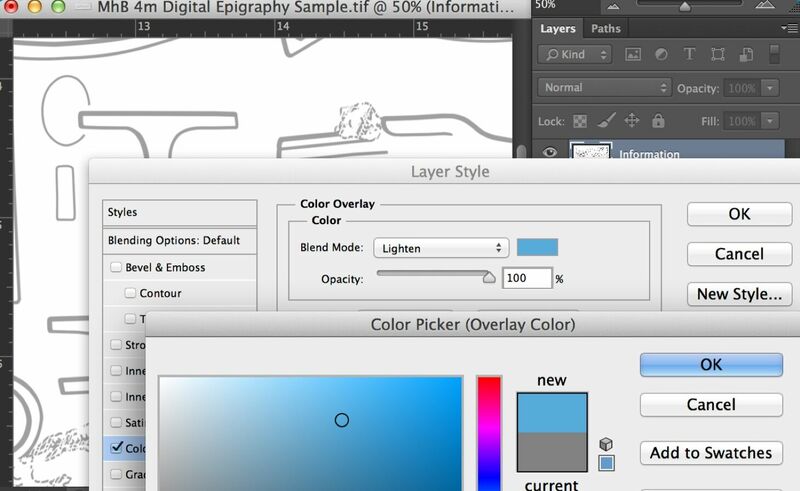 (6)Hit the color panel next to the Blend Mode drop-down menu and choose the color you want to apply on the drawing. 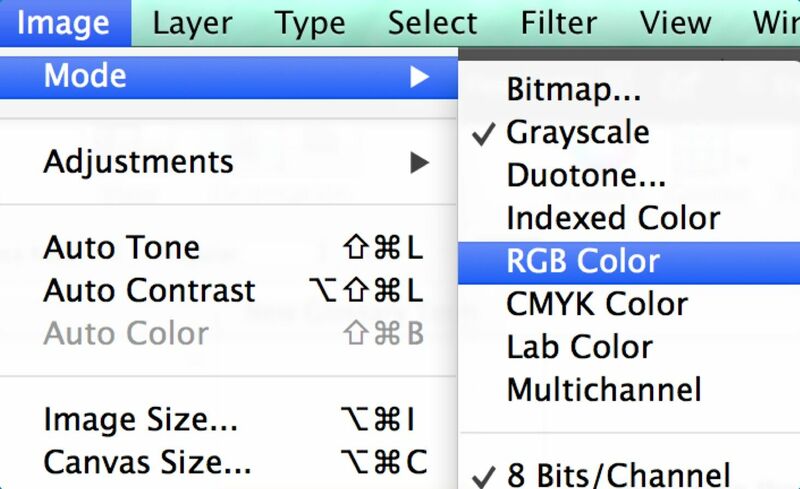 Use the Color Picker or the preset Color Libraries to determine your color. 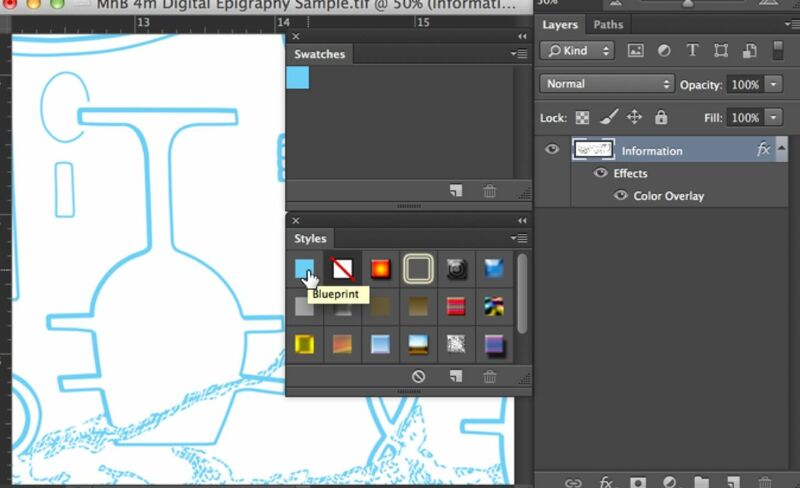 (7)Once you find the right shade of your blueprint it can be added to the Photoshop swatches (Add to Swatches), so it doesn’t need to be reset every time you need it (Window/Swatches). (8)The entire sequence of action (changing the Blend Mode and applying the Color Overlay) can be saved as a New Style. Make sure both options are checked on the New Style panel. (9)Your new Style can be found in the Styles Panel (Window/Styles). It can be applied from right here every time you need to create a blueprint, eliminating steps 4-8 from the process. 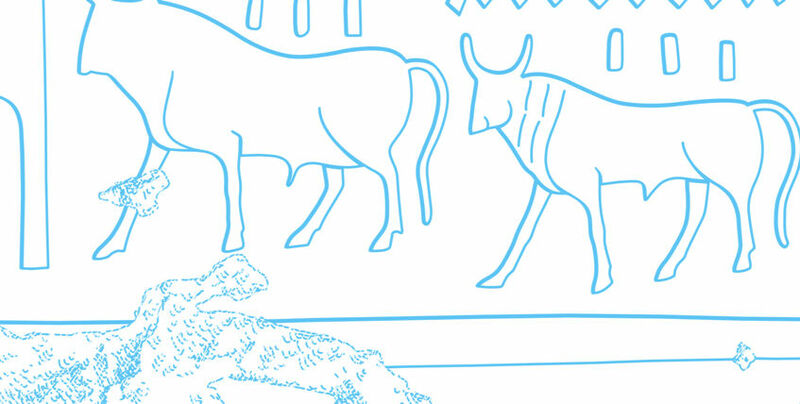 As part of the collation package, paint sheets are regular (i.e., black-and-white) printed copies of the inked drawing. They can thus be made fairly easily by flattening the digital drawing and hitting print. 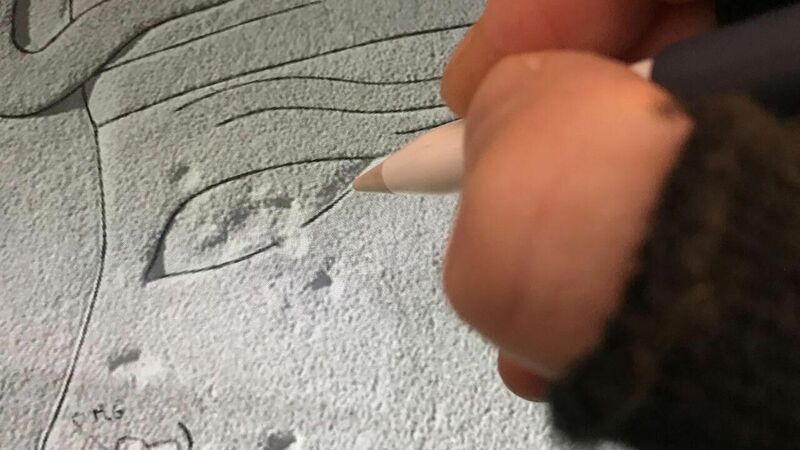 As an advantage of working with layers, however, one can emphasize certain features while making other features less obvious. 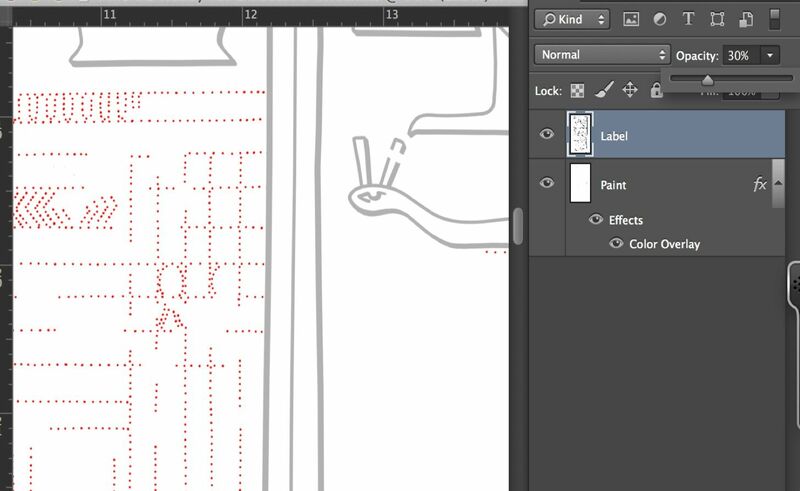 Highlighting the (sometimes barely visible) dotted lines by using a different color directs the focus on the paint during collation. 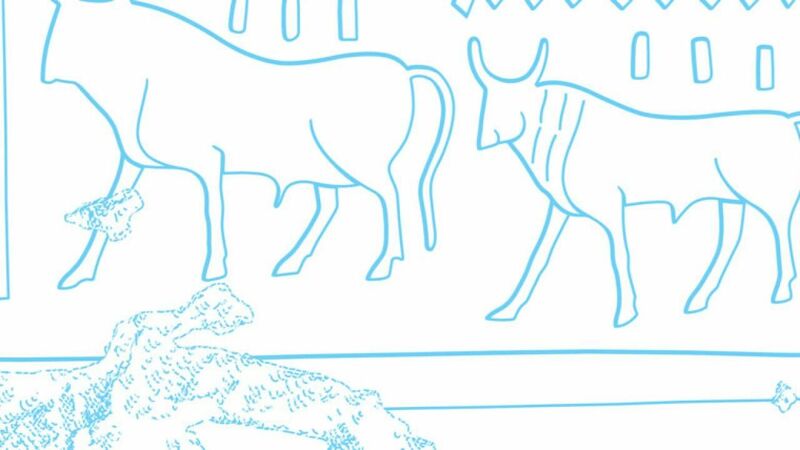 There is a further advantage of this color differentiation: we are able to distinguish between painted and carved lines when they overlap each other. This feature opens up a whole new set of opportunities for collecting color data, especially when dealing with very ﬁne small-scale painted details. Any layer can be emphasized or made less apparent by changing its color scheme. 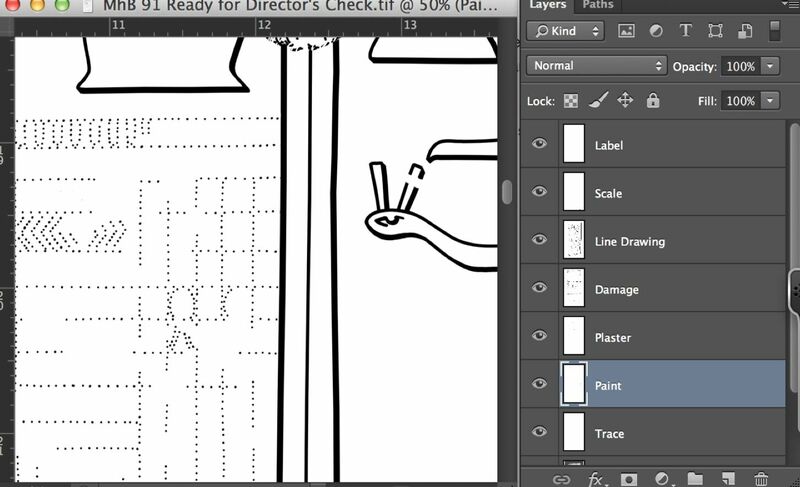 (1)Open your drawing and make all the layers that shouldn’t be part of your Paint Sheet invisible. 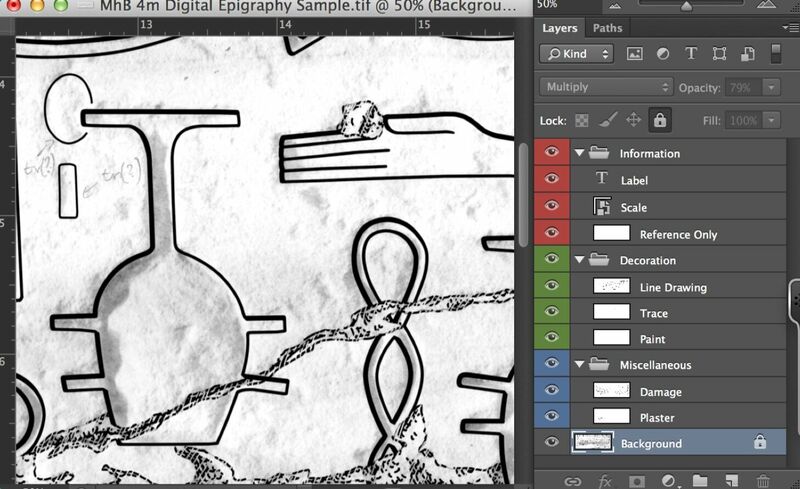 Make sure that the Opacity is 100% on all the layers. Don’t flatten your image. (2)Change the color mode of your drawing to RGB (Image/Mode/RGB Color). Note that RGB mode adds quite a bit to your file size. The image quality shouldn’t be changed (8 Bits/Channel). 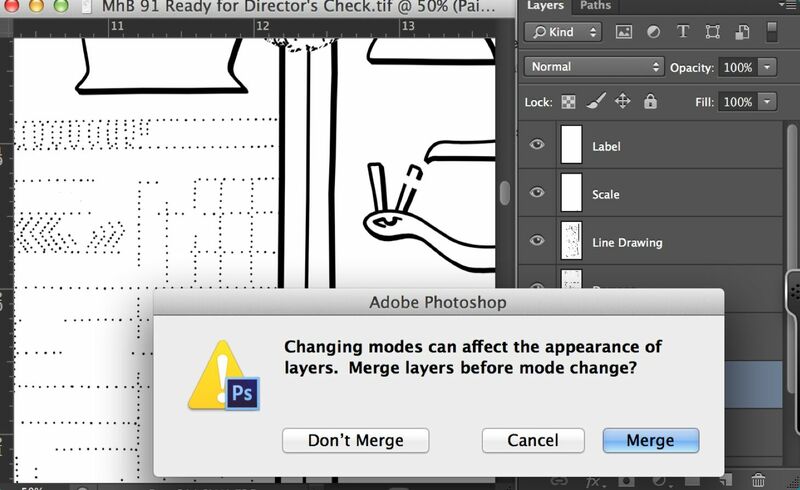 (3)When asked if you’d like to merge the layers before the mode change, choose Don’t Merge. Merging the layers would prevent you from being able to modify the Paint Layer separately. (4)Make sure you are on the Paint Layer. 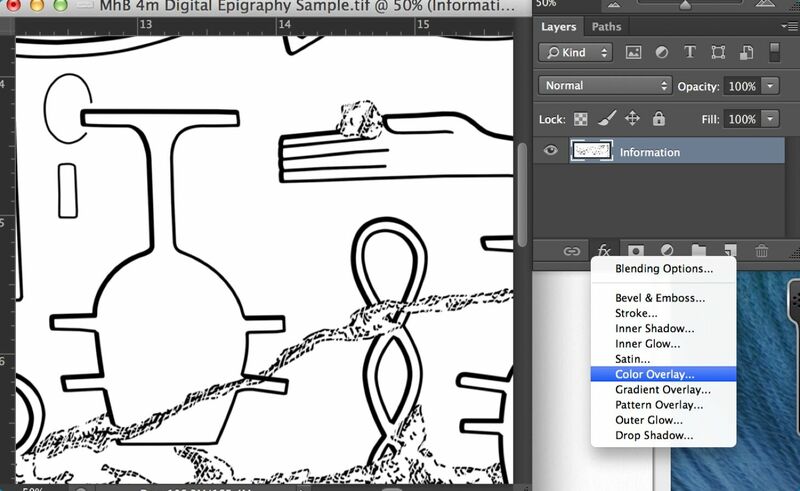 Hit “fx” and add a Layer Style to your drawing. Pick Color Overlay from the drop-down menu. 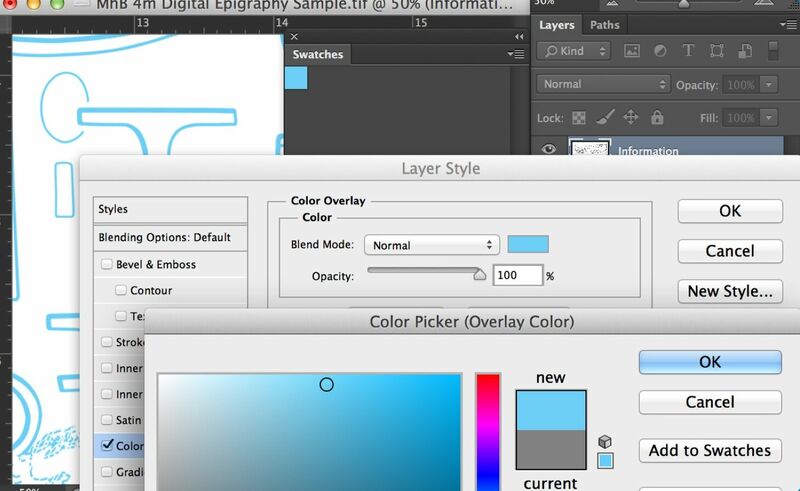 (5)Hit the color panel next to the Blend Mode drop-down menu and choose a color to apply on the drawing. 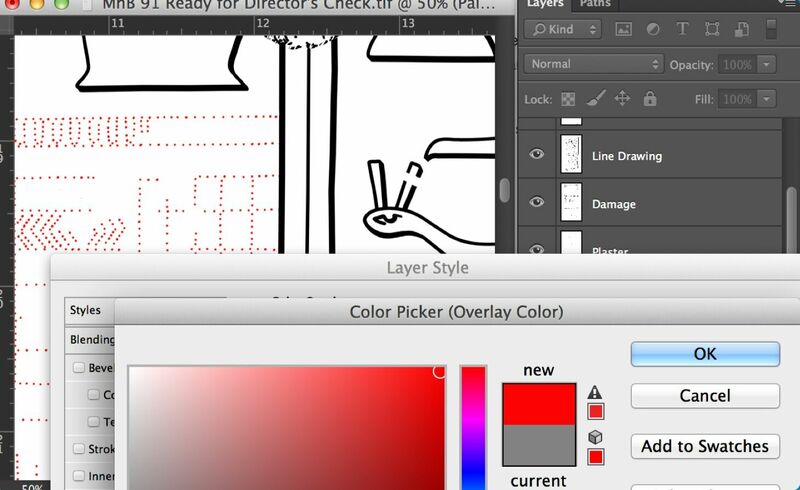 The full red in the upper right corner on the Color Picker panel is recommended. (6)Save your color pick by adding it to your Swatches collection. Remember that swatches can be customized so that a particular collection would refer to a particular working environment. 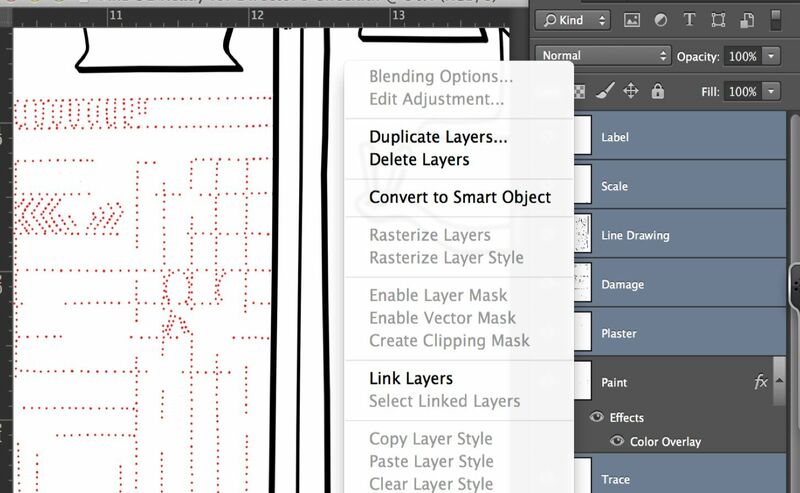 (7)Now select all the other layers except your Paint Layer. 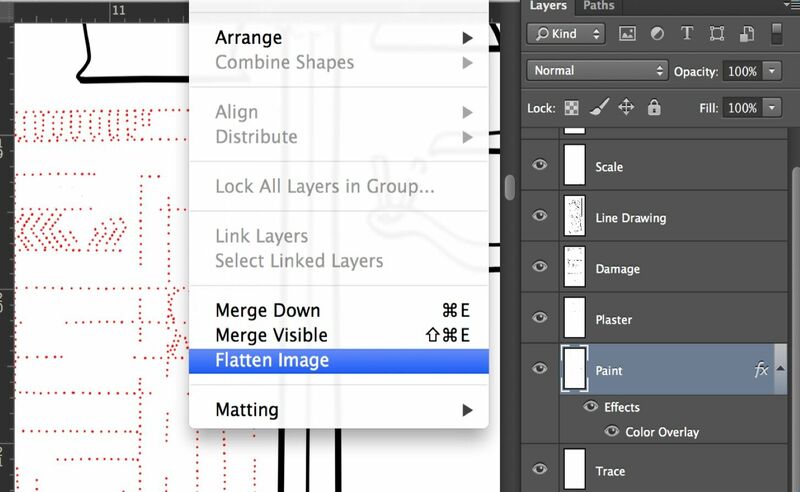 Hit right click (secondary click) and pick Merge Layers from the drop-down menu. (8)All your layers except the Paint Layer should collapse into the top layer. 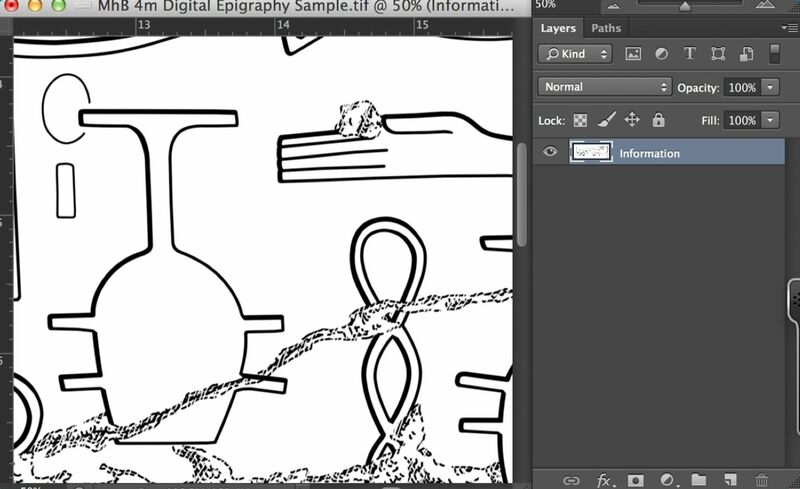 Change the opacity of the layer to 30%. This makes the inked lines stay in the background while the paint lines glow. (9)Now go to Layer and choose Flatten Image. 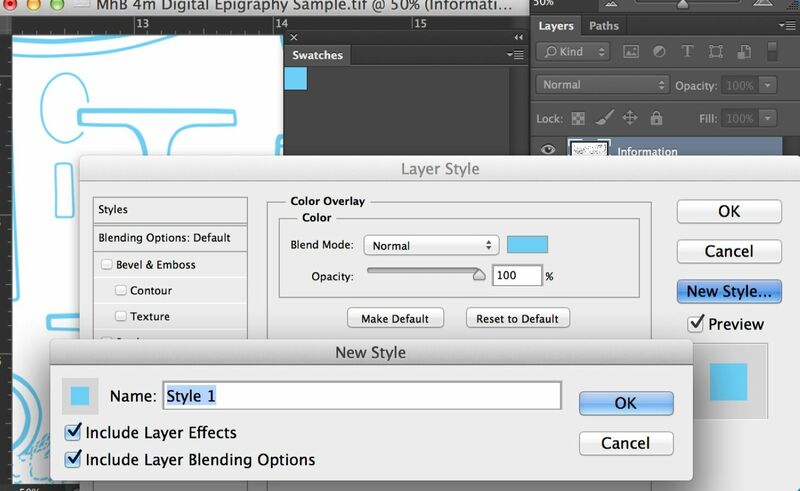 This command collapses all your layers into the top one. Always save your image as a new file, don’t overwrite your source file (Save As). Once the collation is done and the epigraphers and the artist are all in agreement about the changes to be made to a drawing, the artist has to transfer all these modifications from the collation sheet to the computer.